5.11+, V. (South Africa Grade 25).Blue, 2009. 5.9, IV. (South Africa Grade 18).Red, 2009. 13-17 South Africa Grade (5.5-5.8 US Grade). 5.11+, V. (South Africa Grade 25). Begin by starting up the obvious right leaning ramp until it is possible to traverse directly left into the hanging corner system that forms the route. Pitch 1: 5.10-, 50m. Traverse left into corner (5.7, little to no gear) and then follow corner through a series of perched flakes and pillars and onto a bucket seat stance on left wall. Big gear needed for anchor. Pitch 2: 5.10, 25m. Continue up the corner in the off-width until a small stance after the crack pinches down. Pitch 3: 5.10, 35m. Continue up the hand and finger crack, past a horn and into another crack system above until a break in the right hand wall provides a stance. Pitch 4: 5.10, 35m. Follow the clean crack above into a chimney, wrestle out of the chimney into the short over-hanging hand crack above and stop at the large ledge (1 X 3 meters) at the base of the “enduro” corner- which starts with a rightward arching crack. Pitch 5 and 6: 5.11 and 5.11-. 75m. The first ascent party did one 45m pitch and then one 30m pitch, stopping at a slight foot rail on the right face. 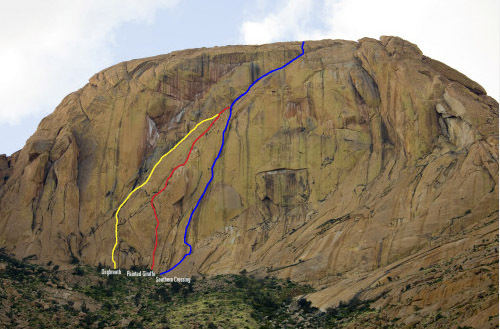 Many of the same cam sizes are needed for these pitches and will dictate your belays. The final belay is in a cave at the base of a wide crack above. Pitch 7: 5.11+, 20m. Stem up the off-width until it is possible to exit right, and then move back left (2 pins) and into a different crack system where the grade eases considerably. Pitch 8: 5.7, 30 m. Continue up the easier ground until you reach the ramp system that cuts the upper face. Pitches 9-13: These are all much more moderate climbing and involve the leader in the chimney systems or out on the exposed face. Continue up the ramp system until it is possible to cut back left to the summit for the quickest finish. Descent: Follow the ridge west to the notch between the main face and the sub spires. Allow ample time to route find around large boulders and notches. It helps to spot this descent from the ground before you start climbing. An alternative descent is to descend to the east and then the south, then finally to the west, behind the summit, otherwise known as the hiking route. We determined that the notch was a quicker descent, albeit more technical. Rack: 1 #6, 1 #5, 2 #4, 3 #3, 3 #2, 3# 1, 3 #.75, 2 #.5, 2 #.4, 2 #.3, and single set of micro cams underneath this size. Full set of nuts. Single rope. 5.9, IV. (South Africa Grade 18). This route follows the ramp and chimney system just underneath the route first climbed on the cliff. Most pitches were 5.7 or easier, with one pitch of 5.9 that can be avoided if you keep heading left and into the higher crack system. The route had a great deal of loose rock, trees, and blocks and is mountaineering/alpine in nature because of these conditions. Rack: Single set of cams and nuts is sufficient, a light set of doubles would enable you to place more gear. FA: R. Lichman and R. Blumgart, December 1974.